Think Miami and you might conjure up Don Johnson in white Versace, neon flamingoes and baseball cap-wearing retirees enjoying the ocean breeze. With the exception of South Beach’s candy-coloured 1950s Art Deco buildings, you are unlikely to think of cutting-edge modern art and design. However, the city, which has earned the moniker “cruise capital of the world”, is undergoing a remarkable turnaround in fortune and style. The international art fair Art Basel at Miami Beach, which in December marked its twelfth year, has done much to put the city on the hipster map, as has the recent opening of Pérez Art Museum Miami (Pamm), on Biscayne Bay in downtown Miami. This was designed by the Swiss architects Herzog & de Meuron, who converted the Bankside Power Station in London into Tate Modern. Next door to Pamm will be the Patricia and Phillip Frost Museum of Science, designed by Grimshaw Architects, who oversaw the Eden Project in Cornwall, to be completed next year. Meanwhile the star British architects Zaha Hadid, Norman Foster and John Pawson have all designed new residential blocks in downtown Miami and Miami Beach. The area is also starting to attract British home buyers, including most recently the artist Tracey Emin. 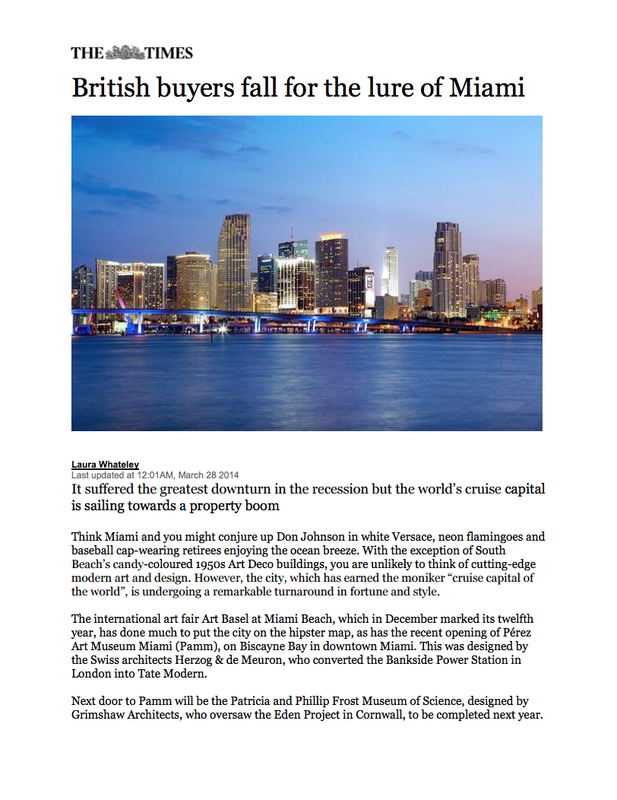 Brits are drawn to Miami by the “three Ws: weather, water, way of life”, says George Mato, the sales director for Ritz-Carlton Residences, a high-end development of 111 condominiums and 15 private family villas designed by the modernist Italian architect Pierro Lissoni. Miami bounced back from the recession quicker than anyone expected, having suffered one of the biggest downturns of any property market in the US. Vanessa Stabile, of One Sotheby’s International Realty, says developers were forced to lower their prices by 40 or 50 per cent during the crash. She describes the rebound as “incredible”; indeed Miami is now among the top ten American cities for house price rises, with an increase of 16.5 per cent in the year to November 2013, according to the latest Standard & Poor’s Case-Shiller Index. “Everyone said it would take seven to ten years for buyers to come back, but it has taken two or three and this is 100 per cent because of international demand. Those who buy into this very modern boom will also secure a slice of history. Ritz-Carlton Residences is a redevelopment of the former Miami Heart Institute where Richard Nixon had heart surgery. Before that it was the King Cole Hotel, named after Nat, a regular guest. The project is in Midbeach, on the spindle of land known as “Miami Beach”, across Biscayne Bay from Miami city. Property here commands a high premium, twice or three times that in downtown, as the land is so scarce. The institute’s original concrete frame has been used, but divided into four separate buildings and clad with soaring hurricane-proof glass windows and delicate metal screens to make the most of Miami’s “absolutely special quality of light”, says Lissoni. Nicoletta Canesi, his partner at Lissoni Associati, says they were also inspired by “lush Miami nature and the outdoor environment of this location”, overlooking Surprise Lake. Apartments, which should be ready to move into in about two years, start from $2 million (£1.2 million) for the smallest at 1,700 sq ft to $25 million for an apartment of 10,000 sq ft. The 111 condos are available in one, two, three, four and five-bedrooms layouts. All have elegant, modernist interiors. The best have 3,000 sq ft terraces, private plunge pools and outdoor “summer kitchens”. The apartments went on sale on a “friends and family basis” in February and 25 per cent are already sold, with so far a 50/50 mix of local and overseas buyers, including interest from wealthy New Yorkers such as the TV personality Martha Stewart. Lots of celebrities including Shakira, Matt Damon and Barry Gibb of the Bee Gees also have sprawling villas nearby. The beach is accessible by boat from a private marina, and residents will have use of a private day yacht to ferry them back and forth. There are also 36 private slips costing $250,000 for boats up to 40ft. Homeowners will also benefit from Ritz-Carlton service, everything from 24-hour concierge, valet, an on-site chauffeur and hotel-like facilities including an infinity pool, spa, indoor and outdoor yoga rooms, gym, kids room, even a dog-grooming parlour. For even bigger budgets the Surf Club, partnered with the Four Seasons hotel chain, is selling apartments from $3 million to $35 million. The development sits along an 815m stretch of beach front in Surfside, North Miami Beach, five blocks from Bal Harbour, which houses the greatest number of millionaires per capita than anywhere in the United States, as well as the most lucrative shopping mall in the world. The exclusive Indian Creek golf course is three blocks away. Like the Ritz-Carlton, the Surf Club is steeped in celebrity folklore. A private members’ social club, it was founded in 1929 by the businessman Harvey Firestone and welcomed the cultural, artistic, intellectual and financial elite at the time: Frank Sinatra; the Duke and Duchess of Windsor; Winston Churchill, who used to paint here. Its beachside cabanas were painstakingly decorated because guests would spend an inordinate amount of time in them, hiding out to drink during Prohibition when alcohol was smuggled across the water from the Bahamas. The new development will restore the existing original architecture, including the cabanas, the Mediterranean revival pavilion with its peacock walk and crystal ballroom, as well as adding two new 12-storey buildings with 157 residences, of which 127 will be private and 30 Four Seasons hotel rooms, all designed by Pritzker prize-winning American architect Richard Meier. Residences will range in size from 875 to 7,500 sq ft, including 13 penthouses with outdoor space of as much again. Selected apartments will have private swimming pools, private elevators, interior gardens and 20ft double-height ceilings. Corner residences will have views of the Miami skyline on one side, a vast turquoise smear of Atlantic Ocean on the other. All apartments, due to be completed by the end of 2015, went on sale in August and almost half have already been snapped up.